It is with great satisfaction that we read this new report from a source so widely respected as the Royal College of Physicians*. The past two years have seen a slew of ill-considered and poorly conducted research hit the headlines regarding vaping and there can be no doubt that the perception of both smokers and non-smokers will have been impacted regards the relative harms of vaping vs smoking. My recent Catallaxy post on the federal government’s hush-hush e-cigarette policy and regulatory review set a cat amongst a few pigeons in the public health and pro-vaping worlds. So let’s hope Simon Chapman and his team of “unbiased’ public health proseltysers take good note of this latest scientific validation of the worth of e-cigarettes as a harm reduction agent and alternative to the deadly weed for smokers…. Electronic cigarettes have exploded on to global markets over the past decade and in the process have generated some strongly polarised views. Some believe that e-cigarettes are a disruptive technology that could consign tobacco smoking to history; others think that they are a distraction from core public health aims of eradicating all nicotine use and a tobacco industry ploy to perpetuate smoking and undermine international tobacco control treaties. One of the world’s most prestigious medical organizations has delivered a groundbreaking 200-page report that supports e-cigarettes as a tool to quit smoking and demolishes several vaping myths in the process. 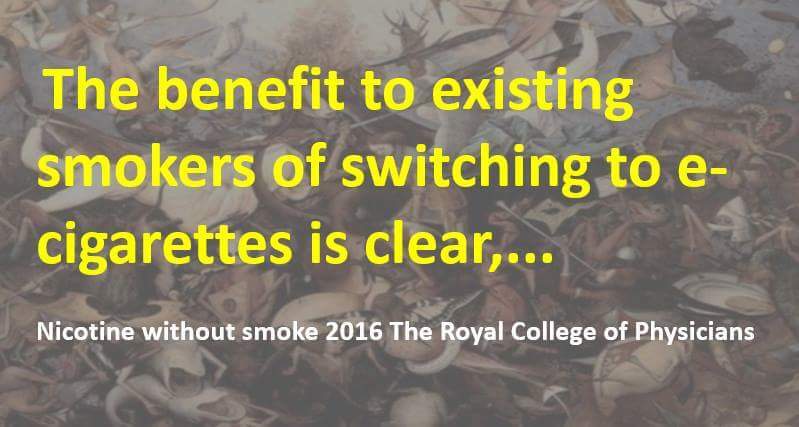 The Royal College of Physicians (RCP), the most respected medical institution in the United Kingdom, concluded e-cigarettes are 95 percent safer than regular cigarettes and are likely to be hugely beneficial to public health…. Join David Dorn, for tonight he celebrates the vape! Electronic cigarettes give a similar level of nicotine as nicotine replacement therapy. People who want to reduce the risks of smoking may choose to use electronic cigarettes because they copy the action of smoking, but are much safer than conventional cigarettes. The trial will determine whether this is as helpful as or more helpful than using nicotine replacement therapy. April 28, 1986 (AP, New York): Today, a coalition of anti-smoking organizations, heath agencies, and researchers are attacking the nation’s cigarette companies for failing to support the development of much safer cigarettes…. The RCP report is in 140 articles. NHS Lanarkshire chiefs are set to review their smoking policy at hospitals after new evidence on the benefits of ‘vaping’. The smoking ban at Hairmyres Hospital, and other hospitals across the area, could be relaxed following a Health Scotland review, which showed that using e-cigarettes can help give up smoking tobacco.. The review and meta-analysis by Sara Kalkhoran and Stanton Glantz on the effects of vaping on stopping smoking is not an objective assessment of the evidence. There are several serious problems with the analysis, but the most glaring is its reliance on studies that enrolled people who smoke, then asked if they had used e-cigarettes. Some 20% of smokers who use e-cigarettes stop smoking altogether, with similar or higher rates in cohorts of smokers who initially had no interest in quitting..
At last. At long, long last. I’m so sorry, I just cannot resist some small gloating satisfaction here. The medical establishment in the UK (in the shape of the Royal College of Physicians) has FINALLY caught up to where I was back in 2008, following my own common-sense research into vaping prior to purchasing one for myself. This vaping lark, no matter the unknowns right now, CLEARLY knocks smoking tobacco into a cocked hat when you compare the potential for damage to health.